One of the most important things about cloth diapering is proper cleaning! Ultimately, your washing regime can cause and affect skin rashes, ammonia burn, diaper elasticity, persistent smell, and even absorbency issues. And in my opinion, many times when people give up on cloth, they describe issues that could have been remedied with better cleaning. But here is the tricky thing, everyone seems to have different advice on the issue! Even manufacturers list unique washing instructions on their packaging. Really??? If the manufacturers and distributors can’t even agree on how to do this than can there really be a “right” way to launder fluff? Yes, I believe there is a right way. And, yes, I believe that there will be necessary variations of this right way due to different types of diapers being used (some with synthetic materials, others natural fibers), water quality, and laundering machines used. But even still, I believe there are four rules that can apply to all fluff families across the board, and that will go a long way in making their cloth journey more successful and enjoyable! Increase your takeaway from this post! 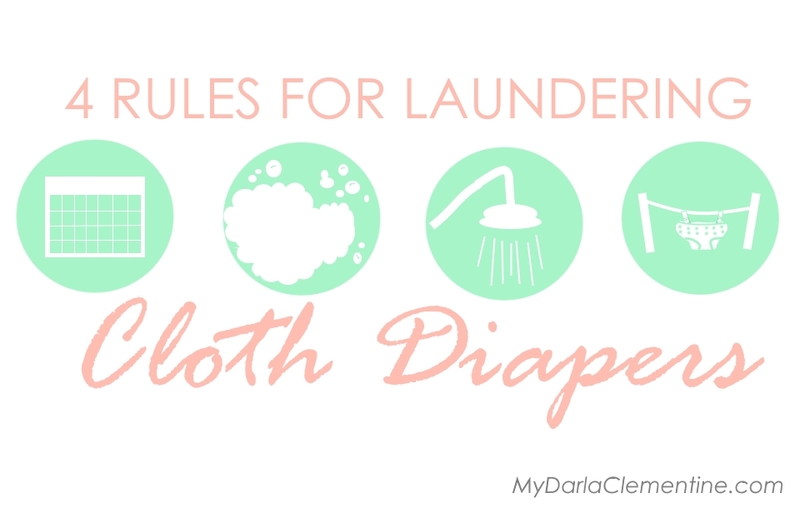 Be sure to download my personal cloth diaper laundering routine below for quick and easy reference! What’s more, the file is writable, meaning you can type over the specifics that I entered and customize them to reflect your own! Um, yes please! Get it now! Already subscribed? CLICK HERE to login to our resource library! 1) Wash Frequently (every 48 hrs). When we first started cloth diapering, I strategically bought a big enough stock to only have to wash diapers every four or five days, purely as a matter of convenience. I was so proud of myself for minimizing my work, that is until something dreadful happened; my diapers started to smell. I had read about this smell on blogs before, it has been lovingly coined “barnyard” stink by many other mamas who have fallen prey, and barnyard is exactly what our diapers smelled like. The fragrance was accentuated anytime the diapers were wet, even coming directly out of the washing machine. When Clementine would have a wet diaper, people would sometimes ask if she had a dirty one because the potent smell would start to permeate again. Why was this happening? Oh, I will tell you. Optimally, diapers should be washed every 48 hours, maybe stretched out to 72 hours if you want to live on the edge (but chances is that they will start stinking again). Otherwise, your soiled cloth ends up sitting for days, in essence, “setting” the soil, each time making it harder for the diaper to truly become clean. Even if you spray or rinse the diaper after it has been soiled, remnants of your child’s mighty deed still lurk and, if left, will start to leave their signature on the fibers, also commonly bringing that lovely barnyard stink or building up ammonia (and let me tell you, ammonia burn is not pretty). 2) Use the Right Detergent and Enough of It. Some natural detergents, like soap nuts or Ecos, aren’t strong enough to do diaper duty. Though these options may be strong enough for everyday dirt and sweat that soil other clothing, I personally have not found these detergents to properly deal with the regular soiling of urine and feces. Are they “safe” for cloth diapers? If you mean can they be used without destroying your diapers with harsh chemicals, then yes they are safe. But are they strong enough? Some people say yes, I’m not convinced. So what detergent should you use? The two “natural” detergents I have personally used with success over long periods of time are Method and Seventh Generation. There are certainly other brands I could try, but after several months of cloth laundry troubleshooting and rashes, I’m very happy with these two options and don’t want to mess with a good thing! Important: you will also need a booster (like borax or washing soda) if you have even remotely hard water. Untreated hard water can be detrimental to cloth diapering by building up minerals in the fabric which can eventually cause problems like rashes, the fluff becoming dingy or gray, and reduced absorbency. Mineral buildup is often accelerated even further by common CD advice like adding an extra rinse to the end of a diaper washing cycle, or by stripping methods that instruct rinsing repeatedly until no soap suds are present (often around 6 rinses depositing minerals into your cloth each time, eek!). Using softening boosters in addition to your detergent in hard water will not only prevent buildup, but it will enhance cleaning ability by freeing up the detergent from having to fight hard water too and allow it to focus on the soil. 3) Run a Pre-Wash Cycle (with detergent and boosters) Before Running the Full Wash. If you are using a soap bar or homemade detergent, residual buildup could in deed be a problem, but if you’re using detergents that are designed to easily dissolve in water and be rinsed out, then this should not be the case. Any left over detergent isn’t “stuck” there, and would simply rinse out in the next wash load, not continue to layer. Instead, I do a pre-wash cycle BEFOREHAND with 1/2 the amount of recommended detergent and 1/2 cup of booster. 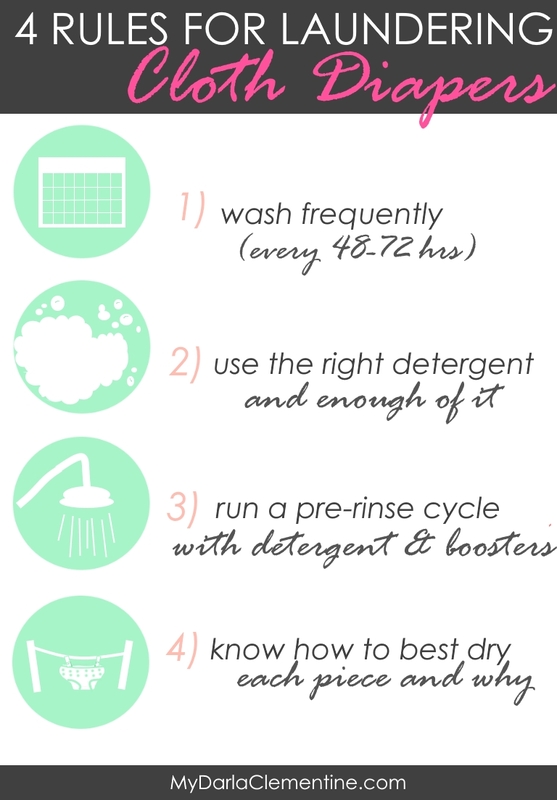 Then I do a full wash cycle using the full amount of detergent & another 1/2 cup of booster. Use boosters in both cycles to ensure mineral buildup doesn’t take place. Use enough detergent to prioritize and ensure true cleaning. Limit detergent only enough (only 1/2 amount is used in the pre-wash) to ensure it will rinse out as long as appropriate detergents are used (i.e. NOT soap bars). 4) Know the Drying Styles That will Help your Diapers, Not Hurt Them. Dryer heat can wear down PUL lining and elastic if regularly used, especially if the elastic is pulled or stretched while still warm. On the other hand, if your PUL starts to peel, ironing the backside or putting the shell in a hot dryer can help to re-seal it again. Be sure to read the labels on your particular diapers for specific instructions, but in general I recommend line-drying when possible. Because we don’t have our own outdoor space right now, we hang dry our shells over the shower curtain rod and towel racks, and run the inserts through the dryer. If we need to bleach stains out from a particular insert, we hang it on a clothes hanger in the window where sunlight can still reach it. Be sure to grab our free printable file! Remember, it is writable, so you can adjust the specifics as needed to match your own family’s routine. Already subscribed? CLICK HERE to login to the resource library! Like I mentioned before, there are many ways to wash cloth diapers. These are the rules that have proven over 2.5 years of experience to be the most consistent and fool-proof for our family. How do you wash your diapers? Let me know in the comments below! I couldn’t agree more! Thanks for the feedback. There is a good online resource called Fluff Love University, and they even provide a chart to the best detergents to use. There is a particular one from Costco’s Kirkland, one of the more environmentally friendly ones. I’m in Canada, and we have a brand called Nature Clean, but they don’t list it there (or if they do, it’s the powder). Hi Kourtnie, it’s my understanding that if your water is treated with a water softener you wouldn’t need to use a booster regularly as mineral buildup isn’t really a risk. Maybe add it in every now and again to simply boost & keep odors at bay. To be sure, though, I know you can actually order test strips online to assess the hardness of your water. Those might help you figure out if your treated water is still hard at all.